The Rigg Design Prize is a highlight on the Australian design calendar awarding one creative practice for their outstanding achievements in contemporary design. This year, the Rigg Design Prize 2018 include a shortlist of ten talented practices including Arent&Pyke, Amber Road, Danielle Brustman, Flack Studio, David Hicks, Hecker Guthrie, Martyn Thompson Studio, Scott Weston Architecture Design, The Society Inc by Sibella Court and Richards Stanisich. We were fortunate enough to collaborate with Arent&Pyke principals Juliette Arent and Sarah-Jane Pyke, associate Genevive Hromas and interior designer Phoebe Stone on their installation ‘Home: feast, bathe, rest’. Here we share an interview with Juliette and Sarah-Jane about their involvement in the Rigg Design Prize 2018 and their design. Can you share with us how Arent & Pyke became involved in the Rigg Design Prize? 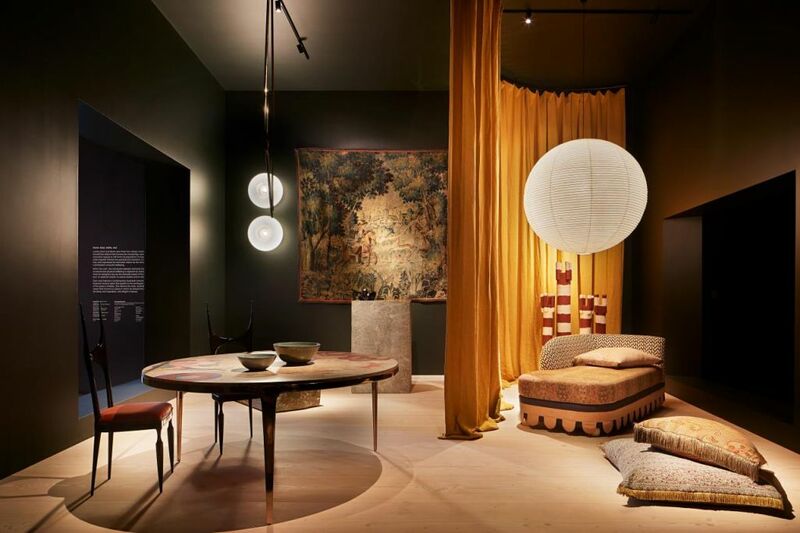 The NGV undertook a search for Interior Design studios that represent excellence in the creative practice of interior design and decoration to create their shortlist for the Prize. It was a great honour to be invited to participate in the prize knowing that such a rigorous and selective process had been undertaken. You’re amongst some of Australia’s top designers, how does it feel to have your work shortlisted alongside your peers? It was a very special moment to reflect on our inclusion in this list. To know that your work is on display in a gallery setting not only for the design community to appreciate but also the general public is truly amazing. The Rigg Design Prize is a wonderful platform for Australian Interior Design and we are so proud to be part of a showcase of what Australian designers are doing. Can you describe your installation and the concept behind the design? We have explored domestic living through the essentials of our needs. Our installation is entitled ‘Home: Feast, Bathe, Rest’ and in it these three modes of living are articulated through a bespoke piece of furniture and a carefully selected artwork by an Australian artist. Two beautiful, and very large, stone pieces define the bathing space and evoke a sanctuary where one can restore the entire being through the ritual of bathing. The design of the pieces was about a transformative process. A rough-hewn solid piece of Luca split stone lies on the floor. We had the stonemason carve away a vessel into the side of the stone, its polished interior gleaming in contrast to the raw stone surround. Behind this piece sits a refined structure clad in smooth Luca split stone skins and an aged brass top. A crystal sculpture by artist Lisa Cooper sits quietly and powerfully on top, the crystals spilling out in away that suggests flowing water and renewal. What drew you to using Eco Outdoor’s Luca split stone? Eco Outdoor’s Luca split stone is stunningly beautiful, we had a sample in the office we were all really drawn to. The warm colours and the tonal variation throughout the natural stone make it really unique. We also have a wonderful relationship with Eco Outdoor and knew it would be a great partnership. As a design studio, you’re well accustomed to designing beautiful interiors. How has the process of designing a sculpture been? What have been the challenges? Wins? Designing these two sculptural pieces with the Luca split stone wasn’t entirely different to the way we approach designing an interior. We start with a vision and sketch out the possibilities. We allow for pauses in the process to check to see if we are capturing the narrative or emotion that we want to convey, the same way we would with an interior. However, the pieces are sculptural objects and so there weren’t the same functional constraints that normally reign in your design. We could be a lot more poetic with their design, which was great. As for challenges, when you are your own client it is very hard to stop designing and say ‘yes this is done!’ not to mention when it is a team of four striving for perfection! Can you sum up the experience of being involved in the Rigg Design Prize? The experience has been exhilarating, humbling, insightful and of course not without challenges! We have loved every minute of creating our space for the exhibition and are so pleased that it is now open to the public. Design studio Hecker Guthrie was awarded the prestigious Rigg Design Prize for 2018 for their installation The table is the base. The Rigg Design Prize installations will be on display at the National Gallery of Victoria until the 24th February 2019.